If you would like to travel threw for the demonstration email: uafglasgow@gmail.com for transport options. The racist and fascists of the Scottish Defence League (SDL) are to march through the centre of Edinburgh during the Edinburgh Festival on Saturday 17 August. After the tragic murder of soldier Lee Rigby organisations such as the SDL have been trying to use this to whip up racism and direct hatred against all Muslims. 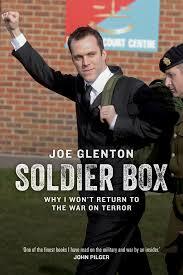 We must not give an inch to those who try to judge an entire religion, race or nationality on the actions of a few. We do not hold all Norwegian Christians responsible for the actions of Anders Breivik whose rampage in 2011 left 77 people dead. Unite Against Fascism (UAF) condemns the SDL’s attempts to use demonstrations to stir up racial hatred. Wherever the SDL go attacks on Muslims and other communities follow. racist and fascist thugs on our streets. MSP said – “I am very sorry that permission has been granted for the SDL march and believe it is now more important than ever that there is a massive counter demonstration against these purveyors of hate who are not welcome in multicultural Edinburgh. cultural city. 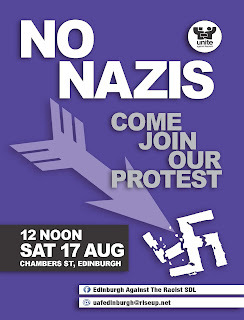 We support the march and protest organised by Unite Against Fascism on Saturday 17 August at midday, assemble Chambers Street. The annual general conference will be a chance for the whole of the Stop the War membership to discuss the complexity of the new forms of war we have witnessed, to plan further action and to debate how best to strengthen the anti war arguments and organisation. The conference will take place on Saturday September 14th from 10 - 5pm at The Old Cinema University of Westminster 309 Regent St W1B 2UW. Stop the War groups can send up to four delegates and other affiliated groups can send two delegates. Conference is also open to individual members. Members must be paying a monthly or annual subscription - if in doubt please get in touch to check your membership status. Members who joined before 15th of July 2013 have full voting and speaking rights. Members who joined after this date can take part as observers. All delegates must register by Friday 7th of September. Registration costs: £10 standard / £5 concessions. The conference will discuss the general state of the war on terror, movement priorities and how best to organise locally. STW groups and affiliated organisations can submit one resolution per organisation. The deadline for submission is Friday 30th of August.